Andy Fite is a jazz guitarist, singer, and songwriter living in Stockholm, Sweden since 1994. Before that he lived in New York City for ten years. Arriving in New York in the mid-1980s, Andy began an intensive study of improvisation with pianist Connie Crothers, and very soon the insights he gained there led to a great breakthrough and an original style. Soon he was playing regularly with a number of close friends of the late pianist Lennie Tristano, a big hero and great source of inspiration in Andy’s music. 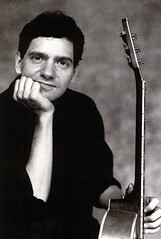 In 1987, Andy was invited to join the new co-operative record company New Artists Records (www.newartistsrecords.com), and there he made six CDs as leader or co-leader between 1988 and 1997. His playmates on these discs include Liz Gorrill, Red Mitchell, Bob Casanova, Carol Liebowitz and Roger Mancuso. He also works as a teacher, working with guitarists and singers as well as anyone else who wants to develop their capacity to express themselves more deeply, and especially spontaneously. He works in his own private studio and at Kulturama in Stockholm, and has guest-lectured at the Royal Academy of Music, Uppsala University, Birka Folkhögskola and Bollnäs Folkhögskola in Sweden, the Sibelius Academy and Oulu University in Finland, and elsewhere. He is also a performer in children’s television in Sweden.